Where did Desertec come from (and why did it take so long)? Large-scale solar power may still be a shimmering mirage on the desert&apos;s edge, but since last week, when a group of European companies laid out a half-trillion-dollar plan for a solar power plant in North Africa, it&apos;s a mirage with international financing. Siemens and a consortium of 11 other firms want to provide Europe with up to 15 percent of its energy from African solar-thermal sources by about 2020. The idea is old, but the caliber of support is new. Last week&apos;s announcement revealed just who was involved: Not just Siemens and Munich Re (the German answer to AIG) but also the Spanish power company Abengoa, a Swiss power-grid company called ABB, an Algerian conglomerate called Cevital, a number of big solar companies and investment banks, not to mention the European Union. 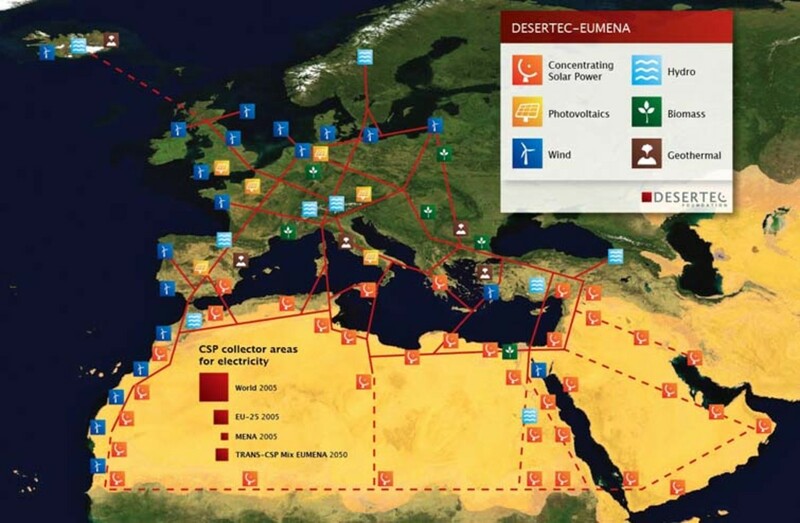 The investors have pledged to raise €400 billion ($555 billion) for the Desertec initiative, which envisions ranks of curved mirrors in the Sahara, concentrating solar heat to drive steam turbines. The power plants would move electricity to Europe through a still-unbuilt "energy superhighway" under the Mediterranean. One reason this initiative looks profitable is that it involves no bleeding-edge science. No one at Desertec or its investment firms will bite their knuckles waiting for a great leap forward in photovoltaics. Solar thermal power is just concentrated heat, and Desertec&apos;s trick to store the heat at night, using tanks of molten salt, has been known since at least 1948. The trans-Mediterranean power grid will be ambitious, but Siemens has already built a similar grid between Australia and Tasmania. The Desertec system is not a theoretical riddle. The real riddle is: What&apos;s taken so long? Particularly in the United States? American deserts receive almost as much sunshine as the Sahara, and they&apos;re more stable, politically, than Algeria or Morocco. 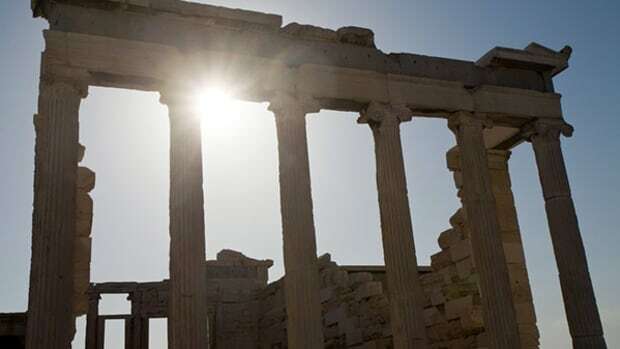 A big solar-thermal project also wouldn&apos;t need the level of international organization that Europe and North Africa have just started to assemble. A number of solar-thermal plants were built in the &apos;80s in California, spurred by the 1970s oil crisis, but when the price of oil sagged again the technology no longer looked so hot. "People lost interest in solar-thermal power because fossil fuels became unbeatably cheap," Hans Müller-Steinhagen told Der Spiegel magazine. Müller-Steinhagen heads the Institute of Technical Thermodynamics at the German Aerospace Center, which the German government hired to test the Desertec plan&apos;s feasibility. Solar-thermal projects need to be huge. Unlike photovoltaic panels, a few mirrors installed on neighborhood rooftops can&apos;t do much good. So the idea has to be popular in boardrooms. The recent spikes in the price of oil help explain both the Desertec initiative and a number of smaller projects in the U.S. Plans for 17 new plants from the Mojave up to Victorville have come under review in California since 2007, and Nevada Solar One, a 400-acre facility outside Las Vegas that currently powers over 14,000 homes, opened the same year. But oil prices aren&apos;t the whole story. The risk involved in starting these projects has kept big companies out of the solar-thermal market. Government programs to mitigate that risk — also known as "renewable electricity standards," or RES — lie behind the new wave of solar-thermal projects in both Europe and the U.S. The difference is one of scale: Europe has an EU mandate to derive 20 percent of its energy mix from renewable sources by 2020. This standard will steer both public money and demand for solar energy toward Desertec once it gets under way. In America, states decide these mandates. Nevada has an RES requiring solar energy to make up at least 5 percent of its energy mix by 2015, and José Entrecanales, CEO of the Spanish firm Acciona, which helped build Nevada Solar One, said government support made all the difference. Without the state-mandated demand for NS1&apos;s kilowatts, he told Time magazine, "It would have been a very risky venture." California has stringent standards of its own, (the flagship number is 33 percent by 2020) which account for the raft of new solar projects there. But, so far, Congress hasn&apos;t settled on a federal RES to match Europe&apos;s. The House and Senate are mulling bills right now, but resistance from coal- and nuclear power-producing states has watered them down. Alaska Sen. Lisa Murkowski, for example, managed to add an amendment to the Senate&apos;s bill that would include nuclear energy under the definition of "renewable" — not because uranium is so easy to find but because nuclear power won&apos;t boost global warming. "The government should not mandate winners and losers," Murkowski said in a statement last month. "We should instead encourage private industry and the free market to determine the best, most economical, emissions-free energy solutions." But the resulting bill is weak enough to be counterproductive, according to Marchant Wentworth of the Union of Concerned Scientists. The Senate&apos;s "anemic standard would do absolutely nothing to promote clean electricity," he said in a statement of his own. "What&apos;s worse, it could undercut state renewable energy programs. No one wants a federal bill that would take us backward." Note: This is a sketch of possible infrastructure for a sustainable supply of power to Europe, the Middle East and North Africa (EU-MENA). The red squares indicate the space needed for solar collectors to produce the present power for the world (18.000 TWh/y, 300x300 km2), for Europe (EU 3.200 TWh/y, 125x125 km2) and for Germany or MENA (Middle East and North Africa, about 600 TWh/y, 55x55 km2). The square labelled "TRANS-CSP Mix EUMENA 2050" indicates the space needed for solar collectors to supply the needs for seawater desalination and about two-thirds of the electricity consumption in MENA in the year 2050 and about one-fifth of the European electricity consumption by Concentrating Solar Thermal Power Plants (2,940 TWh/y in total).